Over the last year Microsoft asked Google to censor nearly 5 million webpages because they allegedly link to copyright infringing content. While these automated requests are often legitimate, mistakes happen more often than one might expect. 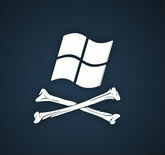 In a recent DMCA notice Microsoft asked Google to censor BBC, CNN, HuffPo, TechCrunch, Wikipedia and many more sites. In another request the software giant seeks the removal of a URL on Spotify.com. In recent months the number of DMCA takedown requests sent out by copyright holders has increased dramatically, and it’s starting to turn the Internet into a big mess. One of the problems is that many rightsholders use completely automated systems to inform Google and other sites of infringements. That these automated tools aren’t always spot on is nicely illustrated by a recent DMCA notice sent to Google on behalf of Microsoft. 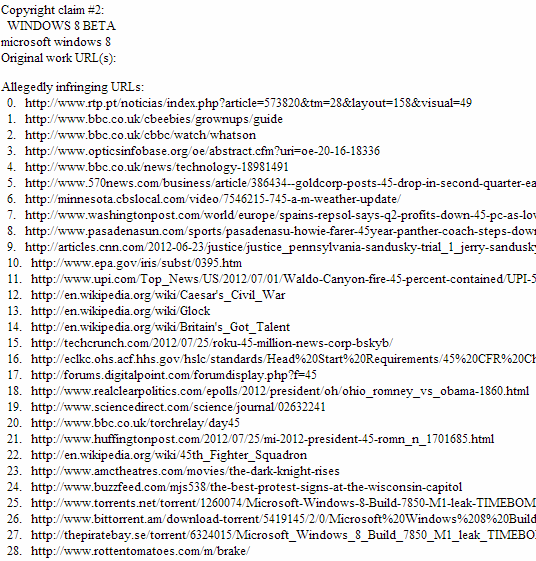 Claiming to prevent the unauthorized distribution of Windows 8 Beta the software company listed 65 “infringing” web pages. However, nearly half of the URLs that Google was asked to remove from its search results have nothing to do with Windows 8. This apparent screw up in the automated filter mistakenly attempts to censor AMC Theatres, BBC, Buzzfeed, CNN, HuffPo, TechCrunch, RealClearPolitics, Rotten Tomatoes, ScienceDirect, Washington Post, Wikipedia and even the U.S. Government. Judging from the page titles and content the websites in question were targeted because they reference the number “45”. Unfortunately this notice is not an isolated incident. In another DMCA notice Microsoft asked Google to remove a Spotify.com URL and on several occasions they even asked Google to censor their own search engine Bing. The good news is that Google appears to have white-listed a few domains, as the BBC and Wikipedia articles mentioned in the DMCA notice above were not censored. However, less prominent sites are not so lucky and the AMC Theatres and RealClearPolitics pages are still unavailable through Google search today. As we have mentioned before, the DMCA avalanche is becoming a bigger problem day after day. Microsoft and other rightsholders are censoring large parts of the Internet, often completely unfounded, and there is absolutely no one to hold them responsible. Websites can’t possibly verify every DMCA claim and the problem will only increase as more takedown notices are sent week after week. Right now rightsholders and the anti-piracy outfits they employ have absolutely no incentive to improve the accuracy of their automated takedown systems, so perhaps it’s time for them to be punished?